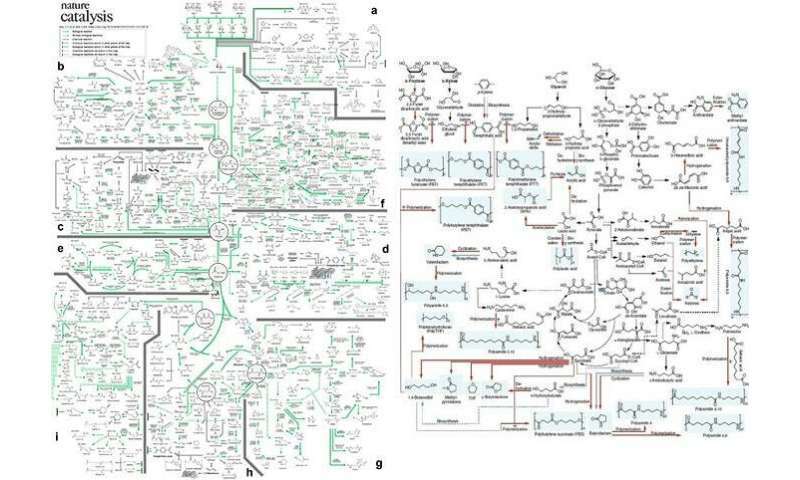 A KAIST research team completed a metabolic map that charts all available strategies and pathways of chemical reactions that lead to the production of various industrial bio-based chemicals. The team was led by Distinguished Professor Sang Yup Lee, who has produced high-quality metabolic engineering and systems engineering research for decades, and made the hallmark chemicals map after seven years of studies. The team presented a very detailed analysis on metabolic engineering for the production of a wide range of industrial chemicals, fuels, and materials. Surveying the current trends in the bio-based production of chemicals in industrial biotechnology, the team thoroughly examined the current status of industrial chemicals produced using biological and/or chemical reactions. This comprehensive map is expected to serve as a blueprint for the visual and intuitive inspection of biological and/or chemical reactions for the production of interest from renewable resources. The team also compiled an accompanying poster to visually present the synthetic pathways of chemicals in the context of their microbial metabolism. As metabolic engineering has become increasing powerful in addressing limited fossil resources, climate change, and other environmental issues, the number of microbially produced chemicals using biomass as a carbon source has increased substantially. The sustainable production of industrial chemicals and materials has been explored with micro-organisms as cell factories and renewable nonfood biomass as raw materials for alternative petroleum. The engineering of these micro-organism has increasingly become more efficient and effective with the help of metabolic engineering – a practice of engineering using the metabolism of living organisms to produce a desired metabolite. With the establishment of systems metabolic engineering – the integration of metabolic engineering with tools and strategies from systems biology, synthetic biology and evolutionary engineering – the speed at which micro-organisms are being engineered has reached an unparalleled pace. In order to evaluate the current state at which metabolically engineered micro-organisms can produce a large portfolio of industrial chemicals, the team conducted an extensive review of the literature and mapped them out on a poster. This resulting poster, termed the bio-based chemicals map, presents synthetic pathways for industrial chemicals, which consist of biological and/or chemical reactions. Industrial chemicals and their production routes are presented in the context of central carbon metabolic pathways as these key metabolites serve as precursors for the chemicals to be produced. The resulting biochemical map allows the detection and analysis of optimal synthetic pathways for a given industrial chemical. In addition to the poster, the authors have compiled a list of chemicals that have successfully been produced using micro-organisms and a list of the corresponding companies producing them commercially. This thorough review of the literature and the accompanying analytical summary will be an important resource for researchers interested in the production of chemicals from renewable biomass sources. Metabolically engineered micro-organisms have already made a huge contribution toward the sustainable production of chemicals using renewable resources. Professor Lee said he wanted a detailed survey of the current state and capacity of bio-based chemicals production. "We are so excited that this review and poster will expand further discussion on the production of important chemicals through engineered micro-organisms and also combined biological and chemical means in a more sustainable manner," he explained.